A lost film about the Manchester legend is showing in the IFI in Dublin tonight. 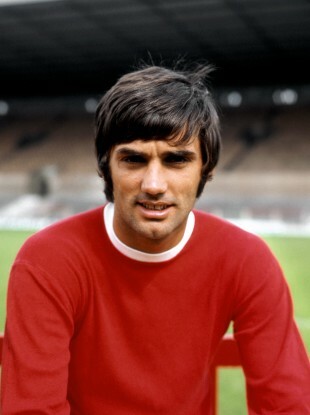 GEORGE BEST WAS one of the greatest footballers ever and yet, more often than not, he is portrayed as a tragic figure. Alcoholism and the erratic behaviour that resulted gave an insight into the darker side of stardom and the impact fame had on the man who was arguably the first celebrity footballer. But many people feel that the joy and exuberance of his early rise is too often unfairly overlooked in favour of the unhappiness that followed. A new release seeks to redress the balance somewhat, showing Best at the height of his fame and genius. Football As Never Before was originally made in the autumn of 1970. One Saturday afternoon when Best was at the peak of his powers, German new wave filmmaker Hellmuth Costard took a camera crew to Old Trafford and focused on the Belfast-born star for the duration of the game. The film gives a unique insight into life as a top footballer — the range of emotions that Best goes through during the game become apparent, as he warms up, looks restless and bored and waits patiently to unleash his astounding talents. Costard, considered a seminal filmmaker of the German New Wave, arranges eight 16mm cameras and eight cameramen to follow Best’s every move. The film will receive a rare showing tonight in the IFI at 8pm — the first screening of the film in Ireland since it was shown in Carlow last year to coincide with the 10th anniversary of Best’s death. And like the Carlow screening, tonight’s showing features a live musical accompaniment. Matthew Nolan (electric guitar), Kevin Murphy (cello), David Stalling (lap steel guitar/electronics), Sean Mac Erlaine (woodwinds, vocals and electronics), Bryan O’Connell (drums/percussion) and Mary Barnecutt (cello) will perform as the film plays. Nolan, a former member of the Irish post-rock band 3epkano, has been a long-time admirer of the documentary ever since he saw it for the first time, roughly a decade ago, at a film festival in Germany. “Stylistically it’s very simple,” he tells The42. “It’s a very ordinary film in some ways and in other ways, it’s a difficult watch, because it’s not presented in the kind of TV sporting idiom that we’re all so familiar with. “Some of the camera angles are (conventional) but most of it in so far as the technology will allow, the director focuses very tightly on Best and that small space that he occupies on the pitch, which means that all of the usual action that we’re used to focusing on when we’re watching televised football happens off camera. “It can generate frustration but it can also generate intrigue and drama in a different way than you might ever have experienced watching a football match in this particular way. “It’s completely fascinating as a cinematic exercise and an experiment in documentary filmmaking and that gets elevated, for me anyway and for a lot of people who have seen the film who are similarly minded, with Best as the subject matter to a place that becomes completely intriguing. With its unique perspective, the film can prompt viewers to think about Best in a different way and look beyond the cartoonish stereotype that is hardly befitting of such a complex figure. Best was almost a mythological figure for me when I was growing up,” Nolan recalls. “I was born in the early 1970s and by the time I reached an age where I was fascinated by football and football culture, he had become the quintessential journeyman just following money and his career was very much on the wane. “A lot of what I know about Best was through other people talking about him. I occasionally might view something on TV, but it was mostly uncles and relatives and people I was close to telling me about how great he was. I think what the director has created is almost another screen for you to start projecting ideas and musings and reflections about Best and who he was. You start thinking about Best in a different way because you’re forced to look at him for 95 to 100 minutes. “It becomes almost a hallucinatory experience just watching the physical endeavour, the stops, the starts, it’s so fragmented. Very little happens, he does score, he sets up a goal for Bobby Charlton, there are some moments of high drama. Nolan and his collaborators are tasked with creating an appropriate soundtrack for the occasion. The music of the era, particularly Krautrock acts such as Can and Neu!, were a big inspiration for the film’s live musical accompaniment. Yet aside from just creating the soundtrack, enabling it to emulate the rhythms of such an unconventional film and naturally flow with the visuals was quite the task. Nolan has worked on live scores for a number of films in the past, including Dracula, The Cabinet of Dr. Caligari, Metropolis and Faust, yet none have been as challenging as this project. It presents the type of challenges that you don’t see in more impressionistic experimental cinema where you’ve got a strong visual sensibility that can provoke and drive creative musical decisions or more obvious narrative-based cinema,” he explains. “Last weekend, with a couple of other musicians, I presented a brand new score for Dracula — the Old Bela Lugosi version. The genre is obvious, the narrative structure is fairly transparent, the mode of characterisation is very familiar. There’s all things there for you to latch on to and build a more traditional score around. Nolan realises the scope of the challenge and accepts that given the enormity of the task, not everything will necessarily flow smoothly this evening. “What we’re doing with our musical accompaniment is in many ways to try to create an alternative experiment out of something that’s already in that terrain. In a lot of ways, I’m accepting that what we’re doing is going to fail. It might succeed for some people. It certainly did when we presented it in Belfast on Tuesday night. A huge amount of people have emailed me since saying that they can’t get it out of their head, even though watching it is kind of like an endurance test as well. The film was effectively lost after its release in the 1970s and poorly received in general upon its initial circulation. However, in many ways, looking at it in a modern context, it seems ahead of its time, though is only now starting to gain proper recognition for its innovative concept. Zidane: A 21st Century Portrait, a cult documentary favourite released in 2006, adopts a remarkably similar style to Football as Never Before and was almost certainly influenced by it, while even modern technological advances in football such as Sky’s ‘player cam’ owe a debt to it. But Costard’s film was so obscure that even Best’s family only recently learned of its existence. The film captures the Northern Irish icon doing what he does best, performing for a large crowd of people on a Saturday afternoon, yet one of the most fascinating and unique moments in the film occurs when the camera follows him behind the scenes. There’s an astonishing sequence at half-time, and this is really where Costard throws down his experimental film/avant garde credentials. There’s a three-minute interlude at half-time where Best walks off the pitch, walks into a space that looks like a loading bay in a dingy factory, walks into an office and just stares down the camera for about two minutes. “He just looks really uncomfortable starting down the lens of a camera. He kind of winces and moves and smiles a little. He looks slightly embarrassed, but the inclusion of that at half-time changes the whole tone of the film. “Then, in the second half, you get literally a different dissection of Best. It becomes really fetishistic, it starts focusing on things like wrists, bottom and feet. A different version of him gets deconstructed across the second half. Tonally, that marks a real shift. So if you can stay with the film until half-time, the rewards are there visually and I would hope (musically). And this is why I’m very open to the fact that this is an experiment — it can and will fail too. But I hope that, across that second half, people will start to really enjoy what we’ve created and the space that we’ve opened up. Football as Never Before will be showing at 8pm tonight in the IFI in Dublin. More details here. The42 is on Snapchat! Tap the button below on your phone to add! Email “‘You start thinking about Best in a different way because you’re forced to look at him’”. Feedback on “‘You start thinking about Best in a different way because you’re forced to look at him’”.